Kennesaw Santa Day Parade. 12pm – 5pm. Main Street. Parade, live music, dance performances, food vendors, crafts and tree lighting. Polar Express Adventure at the Southern Museum. 6pm – 10pm after the City of Kennesaw tree lighting. Attendees will meet a train conductor and a hobo before having the opportunity to create holiday crafts and watch elves make toys in their holiday shop in the Museum’s Glover Machine Works exhibit. They will also be able to write a letter to Santa and meet the jolly fellow himself during the evening. Hot chocolate and light refreshments will be served. A holiday-themed model train layout will also be on display during the event. Santa House at Aunt Fanny’s Cabin (Atlanta Rd, Smyrna). 6-8pm. Let your children enjoy a more personal visit with Santa vs the traditional mall setting. The Best Christmas Pageant Ever. 7pm. Smyrna First United Methodist Church. Presented by the Smyrna Village Players, this play is for the whole family. $10 for adults, $5 for students (grades 1 – 12). Polar Express Storytime at Barnes & Noble, Cumberland. 7pm. Book reading, crafts and special treats. Please note that this replaces the regular Saturday story time which will resume in January. The Nutcracker by the Georgia Ballet. 8pm The Cobb Civic Center. Presale tickets are no longer available, but you can purchase at the venue 1 hour before the event. Presale tickets still available for Saturday and Sunday performances. Home Depot Kids Workshop. 9am – 12pm. Kids will be making a Tic Tac Toe board. Michael’s Kids Club. 10am, 10:30am, 11am, 11:30am. $2 per child. Kids will be making a melted snow man ornament. Candy Cane Hunt at the Mable House. 10am. Activities will include cookie decorating, crafts, marshmallow roasting, photos with Santa and of course the Candy Cane Hunt complete with prizes! Santa’s Secret Shop at Nest Home & Garden. 10am – 6pm. Bring your children to shop with The Nest’s elves for their Christmas gifts. They’ll also get them wrapped there. Brunch with Santa at Social Vinings. Buffet-style brunch begins at 11am. Santa arrives for photos at 11:30. Reservations required. The Snow Princess at Young Actor’s Playhouse (Marietta). 11am & 3pm. Adult tickets $10, child tickets $7. Kidgits PJ Party with Santa at Town Center of Cobb. 1-3pm upper level JC Penny wing. Kids will enjoy milk and cookies, giveaways and special holiday games and activities. Wear your favorite pajamas for an extra surprise (while supplies last). Free for Simon Kidgits Club members; $5 for nonmembers. The Nutcracker by the Georgia Ballet. 2pm & 8pm The Cobb Civic Center. The 2pm session is a special Nutcracker Wonderland performance . Meet the Sugarplum Fairy, enjoy hot cocoa, holiday arts and crafts, and more, prior to the show. Purchase tickets here. Santa House at Aunt Fanny’s Cabin (Atlanta Rd, Smyrna). 6-8pm. Let your children enjoy a more personal visit with Santa than they will get in a Mall setting. Caring Santa at Town Center of Cobb. 8:30 – 10am. Enter through the main entrance between Belk & jcpenney. Caring Santa is an opportunity for children with special needs and their families to enjoy a photo session with Santa. Extra care has been taken to support the sensory, physical and other developmental needs of children so they can enjoy this wonderful holiday tradition. The Nutcracker by the Georgia Ballet. 1:30 pm & 5:30* pm The Cobb Civic Center. 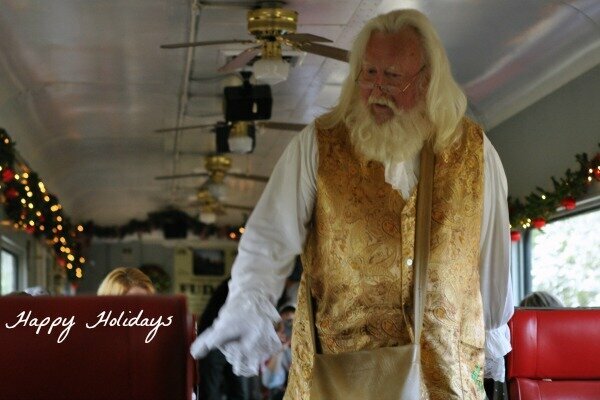 *The 5:30pm time is actually the start time for a special Holly Trolley ride to Marietta Square. Enjoy dinner, holiday shopping, and special offers exclusively for Trolley riders before heading back to the Civic Center in time for the 8pm production. Purchase tickets here.